Chess Forum owner Imad Khachan talks shop with Oliver Armstrong, 8 and his brother Henry, 6. The Chess Forum is steeped in history. The shop's yellowing walls are cluttered with framed photos of grand masters and the owner proudly displays vintage sets, including a civil war chess set with pieces representing the Union and Confederate armies. "This belongs in the Museum of Natural History," Imad Khachan, 52, said of his Greenwich Village business. "This is a dinosaur. But the appeal of it is that it's a dinosaur." For more than two decades, New York's chess community has come to the shop to do battle, discuss strategy, and talk politics and art. 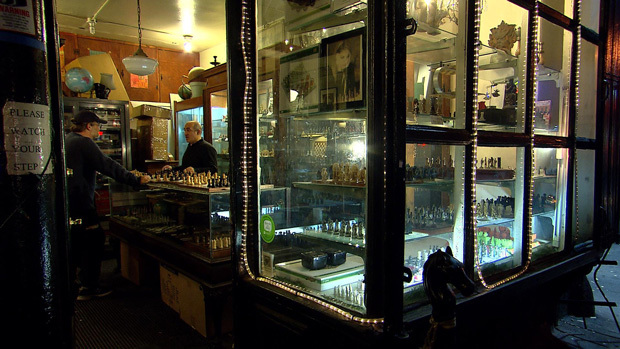 But as shifting demographics, online sales, and rent and commercial tax hikes change the landscape of Greenwich Village, iconic businesses like the Chess Forum are finding it increasingly difficult to bank on nostalgia alone. "There are so many young people residing [in] and visiting Greenwich Village," said Maria Diaz, executive director of the Greenwich Village Chelsea Chamber of Commerce. As the neighborhood gets younger and more affluent, the character of the small business community has shifted and modernized. More than 50 percent of the population in Greenwich Village is now between 18 and 44, and 10 percent between 18 and 24, Diaz said. The young residents are inclined to do much of their shopping online. Diaz also noted that as rents in the neighborhood increase, the owners of ground floor retail spaces are searching for a new market ceiling for leased space. High-profit businesses are eager to take on a brick-and-mortar presence in lucrative retail corridors to drive sales online. "Internet sales allow larger businesses to buy more expensive storefronts where the goal is not to produce a net profit, but to promote sales for an online store," Diaz said. Up against online gaming and sales for years, Khachan attributes the Chess Forum’s perseverance to customer loyalty and divine intervention. "I have to say that I'm surprised that it lasted, or we're still here," he said. "In the mid-90s I thought, 'Okay, by 2000 we should be out.'" "But the minute you doubt, you sink," he added. Imad Khachan shows a customer chess set. Sets range from $10 to $10,000. Khachan is no stranger to persistence under pressure. In the 1990s he found himself applying the rules of chess to his livelihood when it was under a more conventional threat. After an ownership agreement between Khachan and a former business mentor fell to pieces, Khachan opened the Chess Forum directly across the street from his former partner's shop, The Chess Shop. His move triggered what, in New York chess circles, is still known as the Civil War on Thompson Street. "Sometimes attack is the best defense," Khachan said of his decision. His move tore New York's tight-knit chess community in two. A ceasefire eventually settled in, with each shop courting its own customers and suppliers. His business rival closed in 2012, but the feud taught Khachan a lesson as strong as any he learned on the board. 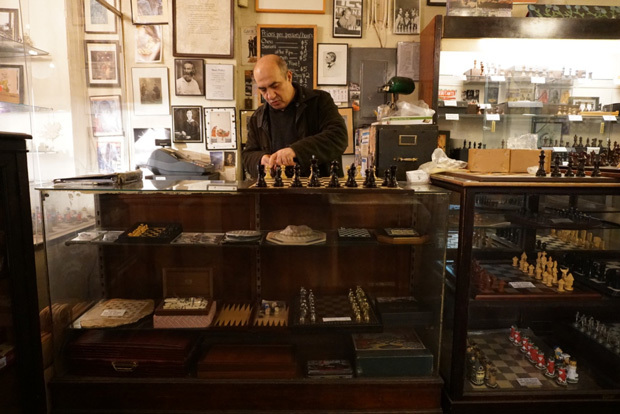 Imad Khachan behind the counter of his West Village chess shop. Khachan opened the Chess Forum in 1995 after a bitter feud with his business mentor. "Like any chess game it's the thinking ahead that keeps you one step ahead of the guy who's shooting after you and not hitting you," he said. "You have to keep moving." Those were the good old days before Amazon, online gaming, and a gentrified neighborhood, Khachan said. On a recent Saturday, the Chess Forum was packed with tourists and regulars alike. Longtime patron Donald Campbell was locked in competition with his friend Kevin Hilly, both of whom have come to play here for years. "It's really a last refuge in the city for me," Campbell said. "There used to be a lot of places where you could go have a nice afternoon and it wouldn't cost an arm and a leg. Those places have all disappeared it seems, or most of them." Despite the increasing odds against holdout businesses like the Chess Forum, Khachan remains optimistic. His favorite chess piece is still the pawn. With hard work and the ability to outsmart the competition, he said, it can be the most important piece on the board. "He can be a knight, a bishop, a queen or a rook," he said. "His choice."